I have an ace-in-the-hole near the end of my ski season. 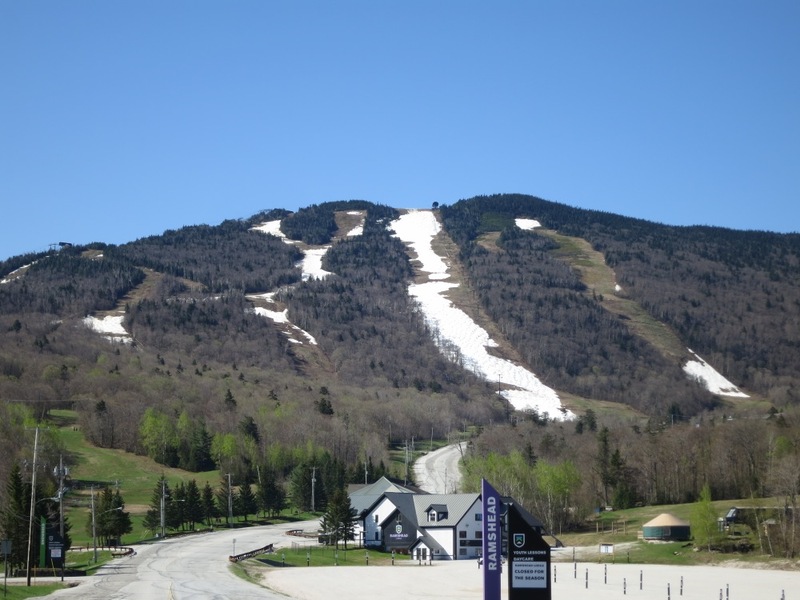 In May, it seems I can come up with business to do in Vermont, and because Killington is once again, the Beast, I can pick up another ski day. This past weekend Killington’s Superstar was the cherry on top of a full sundae of fun that included: driving in the pouring rain, raking out the erosion in our driveway, cutting a new ski trail, putting finishing touches on a website, and talking SEO at MRG. Entering Vermont is different. 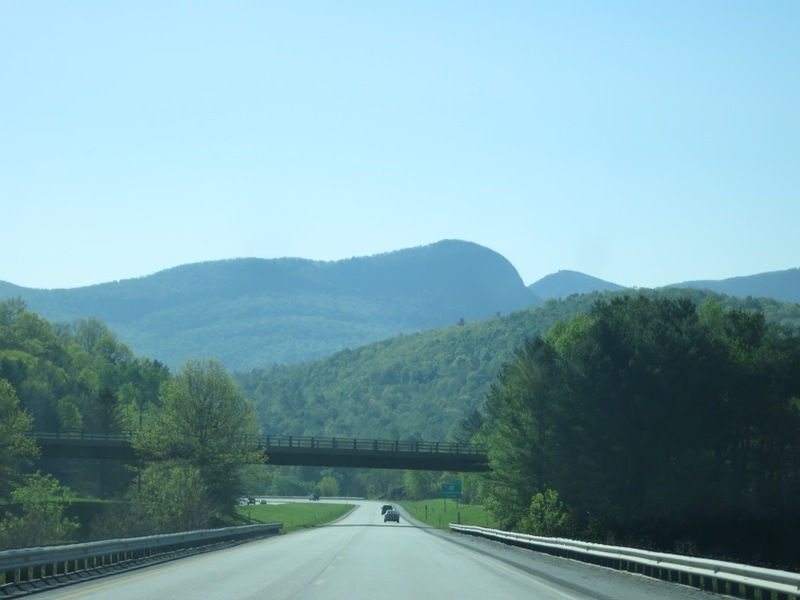 On the surface, northern New York and Vermont have a lot in common, but if you spend time in either one, you know the feel is very different in each. I love both. 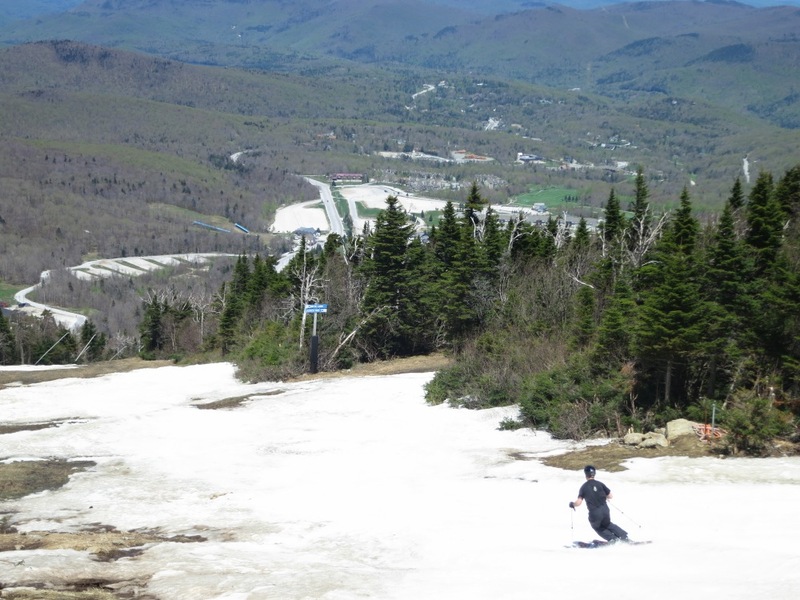 Last year I skied Big K nearly two weeks earlier, on Cinco de Mayo. Superstar was basically wall-to-wall and a little exploring led to some amazing snow. I’d been following on Kzone, and all the regulars agreed that Sunday would be it. On closing day, on the approach, you could see that Superstar was no longer continuous t2b and walking was required. Or, as Riverc0il put it, walking was optional. We saw some very creative and skilled bridge gaping for sure. The bumps actually seemed a bit smaller to me than the those we skied last year, but they were still huge. I did a reasonable job skiing down the fall line on my first run, but it took a huge amount out of me. After my second run, I started to have dreams of skiing the flat snow like we did last year on Cascade. River pointed out the fact that a somewhat steady stream of skiers were coming in off Skylarke, which was technically closed for the season. This peaked our curiosity. 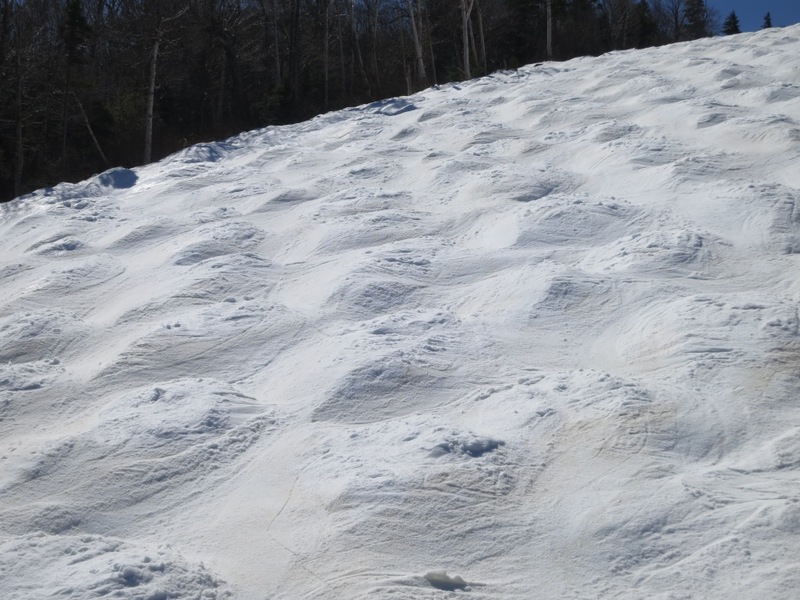 We found soft snow, mellow bumps and shorter, smoother portages than those on Superstar. We did several laps on this alternate route. Eventually we came back and finished on Superstar. I think I did seven runs in total. Still, at 1200′ a pop, I was whipped. The whole damn vibe at Killington was great. In the morning the ticket guy gave me the passholders discount for my Gore pass, taking my word for it. The bartenders and chef were friendly. The food was good and the day was beautiful. Killington is the real deal, a great resort. 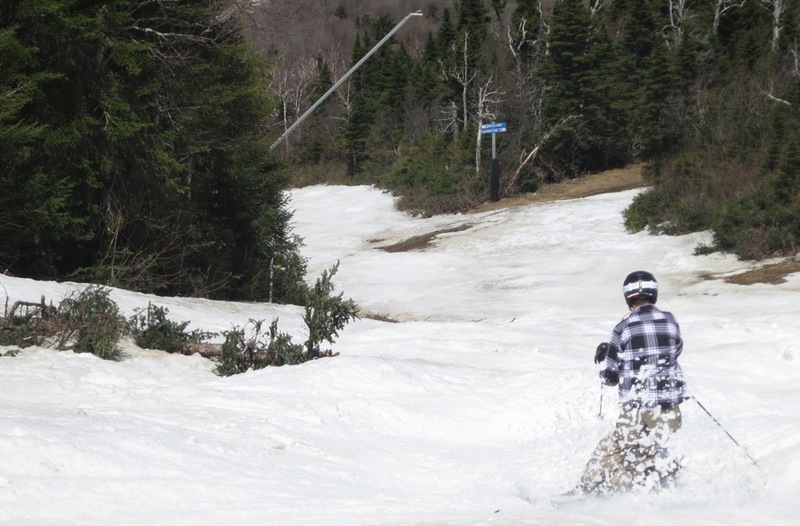 I have to give Killington all the credit in the world for putting on another quality season. Amen Basically had same weekend as Harv. Worked all day Thurs and Friday on house/yard then spent Sun by Saturday in the bumps of Superstar. Also believed the bumps were smaller than previous years but snow was much firmer which may give cause. Ran into several familiar faces from previous springs and a few locals from Maryland who also came up on a whim. Great weekend except for some punk who stole my black puffy jacket I had rolled up and tucked away. Kills my belief that everyone who slides after May 1st is cool. I was there too, I wish they hadn’t posted Ski Patrol at the rope on Skyelark. I may have made it till close. I was alternating runs between Superstar and Skyelark. It was much less strenuous skiing Skyelark. I got three runs in before they put the kibosh on it. I was toast by three, and headed home. I heard it was actually snowing on the summit at close. What a great way to end an outstanding season. The circle complete, it began for me in early November at K. Already looking forward to sliding on snow again.